Nativity scenes from Brienz have a long tradition in Switzerland. The original design was created by Hans Huggler-Wyss in 1915. For seven years, the annual nativity scene exhibition at the National Museum has brought the Christmas spirit to the whole family. This year you can see an especially beautiful design with a long history: a traditional Brienz crib. Brienz cribs have been made by hand for over 100 years based on the original design by Hans Huggler-Wyss (1877 – 1947). Brienz in the Bernese Oberland has been a major centre for wood carving and sculpture since the 19th century. Huggler-Wyss created expressive nativity scene figurines in the early 20th century. He designed the “Christnacht” (Christmas Eve) model in 1915. These figurines were the first of their kind in Switzerland to be mass-produced. To this day, the rough shape is produced using a copy milling machine and the small limewood figurines are then completed by hand with great attention to detail in a process lasting several hours. Each one is therefore a one-of-a-kind hand-painted creation. New figurines were developed every year and the present-day assortment of the traditional “Christnacht” nativity scene consists of more than 150 pieces. The Brienz crib on display is on loan from the Sonderegger family. It stood on the family’s sideboard in the living room every year during Advent and over Christmas. The first set was purchased in the 1960s, when the figurines cost just a fifth of their present retail price. Every year new figurines were added. Subtle differences in craftsmanship reveal when each of the individual figurines was made. 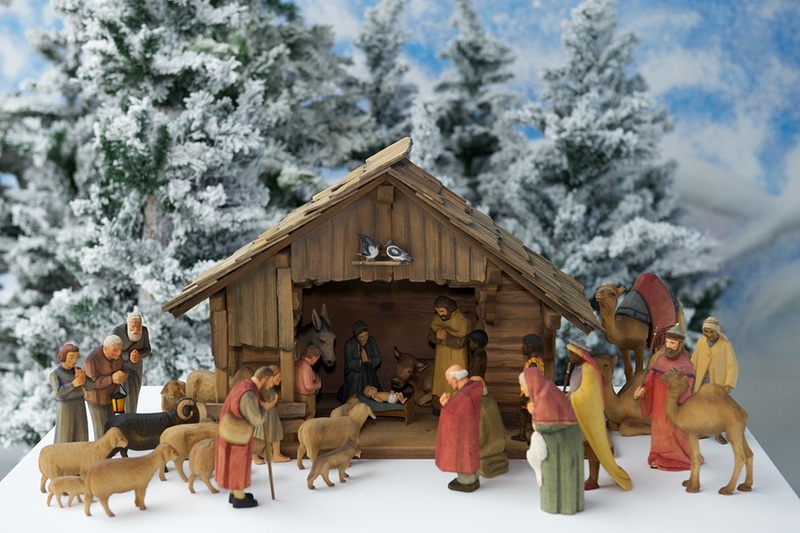 In addition to the wooden nativity scene from Brienz, there are cribs from a variety of other materials to admire, including a traditional Neapolitan crib made of clay, a foldable paper crib and even a glass crib. Nativity scene from circa 1960, wood, carved and painted. Huggler Holzbildhauerei AG. Christnacht (Christmas Eve) model. Private collection. As the days get shorter and Christmas gets closer, the National Museum Zurich invites you to a traditional nativity exhibition. Bring all the family and marvel at the precious mangers and figures lovingly staged in an enchanting winter landscape. This year, the National Museum will be exhibiting nativity scenes made of clay, glass, paper and wood, including a traditional Neapolitan nativity and a nativity from the Czech Republic. There are also Christmas trees with classic tree decorations and Advent calendars from the 1920s to discover. The exhibition is aimed particularly at children, and invites them to explore and play. Children can listen to the Christmas story and Christmas carols, or make gifts under expert guidance.